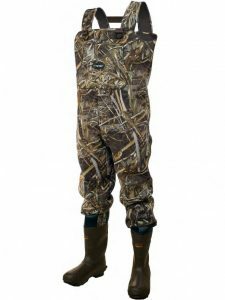 One of the most important parts of equipment for duck hunting is definitely waders. There is an incredibly wide selection to choose from and I will give you a short list of the best duck hunting waders from low to high price ranges. There are many facts to consider and to make your decision easier, we reviewed the most relevant ones for you, so you do not have to test them yourself. There are a lot of reasons why duck hunting is one of the most popular forms of hunting in the United States. One is undeniably how challenging and tough the hunt can be. To reach areas where chances are best to find your prey, you have to overcome all kind of obstacles: Dense bushes, murky swamps, and cold streams or lakes. Therefore the most valuable equipment second to your rifle are probably the best duck hunting waders. They should be durable, abrasion resistant, waterproof and warm enough even on colder days. There are a lot of different attributes you should take into consideration before making your purchase, no matter if you plan on using them in a duck hunting kayak or in a blind. Since duck hunting waders have to withstand a lot more than waders for fly fishing, the best chest waders for duck hunting are made from 3.5mm to 7mm neoprene. All the products presented here combine this material with an additional outer shell of synthetic fabrics like nylon or spandex, to reduce abrasion. Considering that 7mm are really only suitable for extremely cold temperatures, that you will probably never encounter in the United States, this list is narrowed down to 3.5 mm to 5mm neoprene waders. Bonus points if they are fleece lined on the inside for extra comfort. Stockingfoot waders rely on an extra pair of wading boots. While this can be beneficial for fly fishing, extra boots are not really necessary for duck hunting. While fly fishing takes place in crystal clear streams, it is almost guaranteed that you will constantly encounter deep mud holes during a hunt. Therefore you want something sturdy and easy to clean hence the best duck hunting waders are bootfoot. 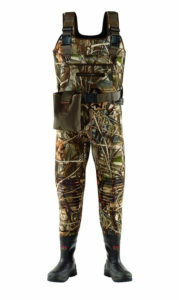 While there are a ton of different camo patterns on the market, waders usually come only in the most ones most popular. Often you will find MAX-4 and MAX-5 Realtree camo patterns or mossy oak. All of them are suitable for duck hunting and will do the trick. Waders come with quite a few different features. The most important one by far is reinforced knee areas. There is not much more annoying than having a leak in your waders only because you kneeled on the wrong rock. The knees are the are area that gets challenged the most, so a reinforcement here is mandatory for the best duck hunting waders. Look out for a pair with D-Rings to attach your shell holder and big front pockets. Also nice to have are handwarmer pockets and insulated boots. On cold days this can make the difference in having to quit, because it is just too cold, or hunting all day. 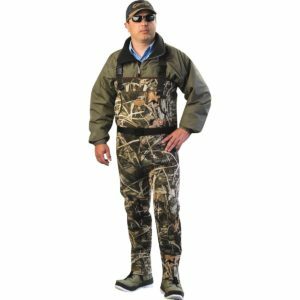 If you think you might need it, it can be worth to look for convertible chest waders for duck hunting. On warmer days they are easily transformed to waist high waders. One of the first things you should think about is how much you want to spend. As mentioned earlier, there are a ton of nice looking features that can easily lead into buying something you do not really need. In my experience, it is better to choose a budget first and afterward find the best duck hunting waders for the money. To make this easier for you I created this list. To be clear, this is not really a ranking between all those products. There is no point in comparing $250 waders to $100 waders and that is why I picked the best waders for duck hunting in each price range, starting from low price to high price. Every time I will include a link to a review for that product, so you can read yourself, why this pair of waders is the best in its price range. 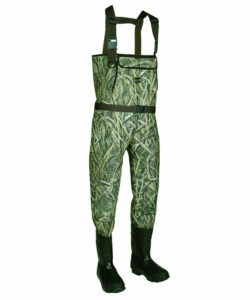 Another pair worth to be in the list of the best waders for duck hunting are the Allen Cattail waders. Also made from 3.5mm neoprene, they come with slightly better-insulated boots than the Frogg Toggs Amphib and therefore withstand even colder conditions. 40 degrees or lower water temperature is nothing you have to be afraid of. Since the feet are usually the first part of the body that cools down, a stronger insulation here improves the overall protection against cold weather. One thing special about the Cattail is the implemented steel arch, which gives an almost hiking boot like feeling. In combination with the toe cap, decent ankle support, and decent tread, the attached boots are one of the best I ever saw on bootfoot waders and definitely beat everything you can get for $100. The camo pattern used here is Mossy Oak and is suitable for all kind of areas you will encounter while duck hunting. In terms of features, they provide a big front pocket, as well as hand warmer pockets and D-Rings for a shell holder. I tested several waders in that price range and the Allen Cattail are definitely the best choice for duck hunting if you do not want to spend more than $100. For this price, you still get a lot of quality and all features you will need out there. Nothing unnecessarily fancy, just a pair of waders that will serve you well for quite some time. Read the full Allen Cattail waders review here. Definitely my favorite pair of neoprene waders. I use them regularly for fishing on colder days and there is nothing in that price range that comes close to the quality they are made of. The material used is 3.5mm neoprene, which is still pretty warm and warm enough for most colder climates. They come with reinforced knees in form of separate knee pads, and all seams are glued, stitched, and taped. I used this pair for quite some time now and can assure you they are durable enough for duck hunting. Features include the classic front pocket with bilateral hand warmer pockets for the colder days as well as D-Rings for a shell holder. The attached boots are insulated with 600g Thinsulate which in my experience works well in combination with the 3.5mm neoprene. Even water temperatures around 40 degrees shouldn’t be a problem. The Frogg Toggs Amphib are available in MAX-5 camo, one of the most popular duck hunting patterns out there. As mentioned before, the quality of this product is well beyond its price and something comparable to waders over $200. With a budget around $150 these are definitely the best duck hunting waders you can get. Read the full Frogg Toggs Amphib review here. The S-Class of the duck hunting waders, the LaCrosse Swamp Tuff Pro. LaCrosse is a well-known company operating since 1879. They have a remarkable reputation and produce only high-quality products. The LaCrosse Swamp Tuff Pro are there flagship waders which won the “Best of the Best” award a few years ago. They are made from 5mm fleece lined neoprene, which makes them incredibly comfortable. The outer is coated with a layer of Lycra and spandex which is meant to improve longevity. Knees and the seat area are covered in stripes made from polyurethane. For the seams, they used their Armor Weld seam-sealing technology, which involves stitching, taping and a coat of rubber. They are available in MAX-4 and MAX-5 Realtree camouflage and offer a wide selection of features. The one that I liked the most, is an ankle lock system, which will hold your feet in place even when you are stuck in a mud hole, trying to get your boots out. Additionally, they come with a game bag, a shell pouch, and the classic pockets. The boots are insulated with 1000g Thinsulate to round up the protection on cold days. These are no summer waders! If you have the budget, these are definitely the best waders for duck hunting you can get. In terms of quality, they beat everything else and will last you several seasons. Although these waders are a bit pricey, they are definitely a high-end product and worth every dollar. If you want to learn more about them you can read my LaCrosse Swamp Tuff Pro review. Waterfowl Wading Systems is a sub company of Caddis. While Caddis offers fly fishing gear, Waterfowl specified exclusively on the best waders for duck hunting. Although there are a lot of reasons to choose bootfoot waders for duck hunting, I wanted to provide at least one alternative option. The Waterfowl MAX-5 Waders are stockingfoot, therefore an additional pair of wading boots is necessary. The waders are made from 3.5mm neoprene with an outer nylon shell to reduce abrasion, the neoprene booties could be a bit thicker though. In terms of features, you will get reinforced knees, D-rings and a big front pocket combined with hand warmer pockets. The camouflage chosen here is MAX-5 Realtree. To reduce the debris and mud that enters your boots, the waders come with already attached gravel guards. All in all the Waterfowl MAX-5 waders are the best choice if your budget is limited and you already own a pair of boots that you wear with them. Otherwise, a cheap pair of wading boots costs around $40, and you probably run better with the Allen Cattail I presented earlier. Still, the quality provided here is surprisingly good for under $100 and even better than you would in some waders twice as expensive. Read the full Waterfowl MAX-5 waders review here. As stated earlier, if you knew your budget before going over this list, the choice of which waders you should buy is an easy one. If you still have to decide on that, keep in mind that while some features are really nice to have they are not mandatory to have in the field. Take into consideration how often and under which conditions you will use your pair. However, as soon as you know how much you want to spend, these are definitely the best duck hunting waders you can get in each price segment. If you want to know how to keep your waders stain resistant and water repelling, have a look at the best waterproofing sprays. There are quite a few good reasons why you should such a product right from the beginning. Frogg Toggs Amphib are a solid choice! I own the for a few seasons now and through REALLY heavy use I actually manage to get a whole in them. I could probably fix it, but I decided to go for a new pair and after reading this I will straight up buy the same pair again. They will serve me well for next years and if used reasonable they are probably unbreakable. In my opinion, definitely the best duck hunting waders out there! Can confirm. Frogg Toggs Amphib beat everything in their price range! Great selection! I run a small outdoor store and my list of best hunting waders would have looked similar. I think you just convinced me to spoil myself and order the Swamp Tuff Pro. Would you guys recommend 3.5mm or 5mm neoprene for the cold days in northern Alabama? We actually would recommend going with 5mm. Alabama can get pretty cold and once there is ice on the water, you will be glad to wear 5mm. Even more important are warm boots. Standing on ice let’s your feet get cold in no time, without proper insulation. The Allen Cattail and the Swamp Tuff Pro both perform well under those conditions. Just to let you know Game Winner Treadlites are excellent waders and are a great value. I got 60 outings in them before seams wore out. I have used Hodgeman, Cabelas, Proline, and Lacross waders previously and all of these brands failed around or before 50 outings. For my money you cant beat Game Winner. Great fit, excellent boot, and best features for the money. Although we had pretty good experiences with LaCrosse and Hodgeman and we are planning on doing some Game Winner wader reviews in the near future. If you want to, let us know your favorite model and we will give it a try. My biggest problem is fit. I am 5’7″ 205. I have a 29 1/2 Inseam, 42 inch chest and 40 waist. I cannot find boots/waders that size with a size 10/10.5 boot. I have to wear heavy socks due to a bad experience with hypothermia and frostbite to my feet. No one will make such a size wader. A wader with a 10/10.5 boot have an inseam that would swallow me like a circus clown. They do make the waders you need. They are called stouts. They make big boy stouts too for short stocky guys.